This is a speedloader I like. This is not to say that I don’t like HKS speedloaders. I have used them for a long time and they have strengths that commend them. The Safariland Comp 1 has a couple of features that particularly appeal. The Comp 1 has a spring loading system. To charge the speedloader, you have to set the cartridges into the holes, hold them, turn the speedloader bullet nose down on a firm flat surface, push down on the body of the speedloader, and lock the cartridges in with a turn of the small knob on the top. This is a bit awkward, but you get the hang of it pretty quick. 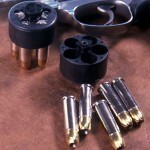 To load the gun, all you have to do is to get the cartridges aligned in the cylinder and push. 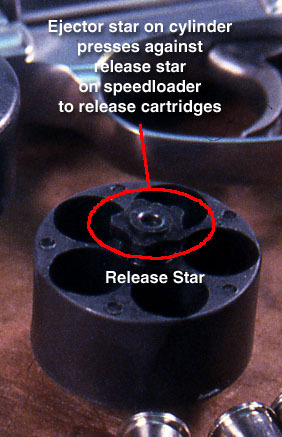 When the star in the speedloader pushes against the ejector star of the gun, the cartridges release and spring into the cylinder. It’s fast and easy to do under pressure. Unlike the offering from HKS, a turn of the locking knob is not required to release the cartridges. In fact, it won’t release them if you do turn it.